· Jim Savastio in Time to Celebrate! recalls why we celebrate the resurrection of Jesus. · D. Scott Meadows in Jesus instead of Barabbas affirms the power of Christ’s substitutionary death. Hope you enjoy this sampling. I look forward to worshipping with you this Sunday dear church family. When the divine voice speaks from the cloud at the transfiguration, what does it say? According to the traditional text, the voice says, “This is my beloved Son: hear him” (KJV; cf. NKJV)). According to the modern critical text, the voice says, “This is my Son, my Chosen One; listen to him!” (ESV; cf. RSV). The difference here is whether or not the text reads agapetos (the adjective “beloved” modifying the noun “son”) or ho eklelegmenos (a participle acting substantively as “the chosen one” in apposition to the noun “son”). The traditional reading is supported by codices A, C (original hand), R, W, family 13, and the vast majority of Greek manuscripts. Among early writers of the post-apostolic Christian era, the reading is found in Marcion and Clement. The modern critical text is supported by p45, p75, Sinaiticus, Vaticanus, and a few others. Metzger argues that the traditional text is a “scribal assimilation” to the other Synoptic transfiguration accounts (cf. Matthew17:5: “This is my beloved Son in whom I am well pleased; hear ye him.”; Mark 9:7: “This is my beloved Son.”) and to the Lukan baptism account (Luke 3:22: “Thou art my beloved Son; in thee I am well pleased.”) (see Metzger, Textual Commentary, p. 148). Metzger also notes that eklelegmenos “occurs in a quasi-technical sense only here in the New Testament” (Ibid). Is it possible, however, that the modern critical reading reflects a lack of comfort with the view of Jesus as the “beloved” Son of God? That is, might it reflect an attempted Christological correction? One might also argue that the fact that this term does not appear in this manner in Luke (or the rest of the NT) is a sign of its lack of authenticity. Furthermore, if the traditional text is an assimilation to Luke 3:22, why does it not follow the second person singular (“Thou art my beloved Son.”) but instead shifts to the third person (“This is my beloved Son.”)? The traditional reading has early and wide attestation. One can see how Christological controversies might have affected the reading. It is also clear that the modern critics usually assume that such agreements among the Synoptic Gospels are due to harmonization, rather than it being an accurate reflection of what actually took place (e.g., the traditional text of Matthew, Mark, and Luke all read, “This is my beloved Son,” because this is precisely what the voice said). Thus, there remain valid reasons for maintaining the traditional reading. Did the transfiguration take place about eight days after Jesus’ passion teaching (so Luke 9:28) or six days after (so Matthew 17:1; Mark 9:2)? Note: When preparing to preach last Sunday on Luke’s account of the Transfiguration (Luke 9:28-36), I ran across an apparent discrepancy among the Gospel accounts. The issue: Did the transfiguration take place about eight days after Jesus’ passion teaching (so Luke 9:28) or six days after (so Matthew 17:1; Mark 9:2)? Is this an insoluble contradiction among the Synoptics? First, the perceived problem might be resolved by pointing out that Luke uses less specific language than Matthew and Mark. While Matthew and Mark agree verbatim, precisely saying that the transfiguration took place “after six days” (meth hemeras hex), Luke’s description is less specific. According to Luke, Jesus was transfigured “about an eight days after these saying.” He makes use of the qualifying adverb “about” (Greek hosei, which might be rendered as “approximately”). If one assumes the traditional views on authorship, then he understands Matthew to have been written by an apostle who was an eyewitness. Mark, though not an apostle, is affirmed to have been the interpreter of Peter, an apostle and eyewitness (cf. 1 Peter 5:13). Luke, however, was an apostolic associate of Paul and not an eyewitness (cf. Luke 1:1-4). It might make sense, then, for his description of the time sequence to be more general. The difference as to time ought not to give us uneasiness. Matthew and Mark reckon six entire days, which had elapsed between the events. Luke says it happened about EIGHT days afterwards, including both the day on which Christ spoke these words, and the day on which he was transfigured. We see that, under a diversity of expression, there is a perfect agreement as to the meaning. Luke says about eight days, probably taking into account the day when Jesus uttered the words of verses 23-7 as well as the day on which the transfiguration took place, so that there is no conflict between his dating and that of Matthew and Mark (p. 282, n. 1). Conclusion: It is possible to harmonize Luke 9:28 with its Synoptic parallels. We must remember that those early Christians who accepted these Gospels as authoritative and collected them into the fourfold Gospel collection would have known of such a discrepancy, and yet they did not see this as offering an insuperable contradiction. Comparison of these passages also lends support to the notion that the Synoptic Gospels (here, Luke, in particular) developed independently (for Luke, without literary dependence on Matthew or Mark). If Luke had had either of these Gospels before him, why would he not have simply followed their wording and say that the transfiguration took place six days after the passion teaching. And he said to them all, If any man will come after me, let him deny himself, and take up his cross daily, and follow me (Luke 9:23). In v. 23, Jesus reveals to his disciples that there will be implications for them that will flow from the fact that “the Son of man must suffer many things” (v. 22). If they are to be Christ-like (“Christians” or Christianoi, as they will first be called at Antioch, Acts 11:26), then they too must suffer many things. First, “let him deny himself.” The verb here is arneomai and it means to deny, to denounce, to disown, to refuse. Have you ever been rejected or disowned or denied by someone you’ve loved or wanted to please? Jesus says we are to reject or disown ourselves! How different is this call from what the world offers! The world says: Indulge yourself, stroke yourself, defend yourself, pursue that which makes you feel happy and comfortable. The world coddles us by telling us we deserve a break today; we need to satisfy and serve ourselves above all. Forget about others, forget about society, forget about God. Just do what makes you feel good. The world builds an altar in our hearts and beckons us to make sacrifice to ourselves. Jesus says go to that altar and tear it down! Second, “and take up his cross daily.” We are not as scandalized by the cross as men were in the first century and as we ought to be today. The disciples would have seen criminals executed by the Romans on the roadways. They would have seen men gasping for breath in a futile effort to prolong their doomed lives. They would have seen the cruel practice of the Romans who made the condemned carry their own crosses to the place of execution. Remember, Jesus is saying all this to his disciples before he even goes to the cross! If you want to follow me, you must die to yourself. You can no longer live. I must live in you. We need to take note of the little word “daily” (in Greek it is the preposition kata and the word “day”). This death to self is not something that happens just once, when we repent of sin and turn in faith to Christ. But it is according to and corresponding with every day that we are blessed to draw breath. Self-mortification is to be daily. Third, Jesus says, “and follow me.” This is the basic call to be a disciple or student of Jesus, to enroll in the school of Christ. You don’t become his follower, till you are broken. Till you have starved your desires in denying yourself. Till you have borne your cross to the place of your daily dying. The stubborn adherence to Markan priority in the face of all its weaknesses compels one to conclude that it has been regarded almost unconsciously as a dogma of scholarship over against the claims of the church to control the dogmatic interpretation of the Scriptures, for the critics seek always to offer an alternative explanation to that of church tradition and belief (pp. 42-43). He notes that defenders of Markan priority were influenced by theological positions and “that ‘extra-scientific’ or ‘non-scientific’ factors exercised a deep influence in the development of a fundamentally misleading and false consensus” (190). While rejecting a conscious connection between Markan priority and evolutionary social theory, he nevertheless concludes “that the Marcan hypothesis exhibited features which commended itself to men who were disposed to place their trust in the capacity of science to foster the development of human progress” (179). Indeed, the theory of Markan priority is based on the assumption that the shortest Gospel (Mark) would be the most primitive and that Matthew and Luke would have expanded and added to their Markan source as the Gospel tradition evolved. It also operates on the assumption that modern "scientific" methodology would allow researchers to uncover the origins of the Synoptic tradition and their primitive sources (Mark and Q). A similar suggestion might be made regarding the overthrow of the traditional original language text of Scripture in the nineteenth century in favor of the modern critical text. It was based on the similar assumption that the lectio brevior (“shorter reading”) is the more primitive (original) and that the ecclesiastical text evolved through harmonization and expansion. Scholars, then, using "scientific" methodology may recover the original text. 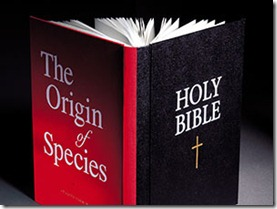 Darwin’s Origin of Species was published in 1859, Holzmann’s Die synoptischen Evangelien in 1863, and Wescott and Hort’s The New Testament in the Original Greek in 1881. Can it be that we are still dealing with the lingering influence of nineteenth century evolutionary thought in textual and Gospel studies? · As Jesus “preached the word unto them” in a private home that was filled to the point “that there was no room to receive them, no, not so much as about the door,” four faithful men lowered their paralyzed friend through the roof so that he could be in the presence of Jesus (Mark 2:1-12). · Andrew told his brother Simon, “We have found the Messiah.” Then John records, “And he brought him to Jesus” (John 1:41-42). · Philip told his friend Nathaniel that he had found the one about whom Moses prophesied, Jesus of Nazareth. He then told his friend, “Come and see” (John 1:45-46). · After meeting Jesus, the Samaritan woman at the well went to her village and invited her neighbors to come and hear Jesus: “Come, see a man, which told me all things that ever I did: is not this the Christ?” (John 4:29). · When Paul wrote to the church at Corinth about their worship practices, he exhorted them to be edifying in their gatherings so that if “one that believeth not, or one unlearned” is in their midst, “the secrets of his heart” will be made manifest and “he will worship God” (1 Corinthians 14:24-25). This assumes the early believers were inviting unbelievers and the “unlearned” to be present in their gatherings so that they might come under the influence of Christ as he was preached in the Scriptures. When a Christian invites someone to come to Lord’s Day worship in the gathering of God’s people, he is inviting that person to be in the presence of Christ as He is spiritually present in the assembly of the saints (Matthew 18:20). He is inviting that person to listen to Christ as He speaks in the Scriptures that are read and sung (Colossians 3:16). He is inviting that person to sit at the feet of Jesus and learn from Him as He teaches (Ephesians 4:21). Let me offer a practical challenge: The last Sunday of this month (March 31st) is “Easter Sunday.” As a Reformed congregation we do not follow the “holy-days” of the so-called “Christian calendar.” We do, however, observe the weekly gathering of God’s people for worship of the risen Jesus on the Lord’s Day, the first day of the week. Many non-believers and even backslidden Christians are open to attending worship on days like Christmas or Easter. Can you begin now prayerfully to consider someone you might invite to “Come and see”? If that person is unwilling to attend our congregation (due to distance or for whatever reason) might you encourage him to seek out another Christ-centered church in his area? Let’s pursue the ministry of invitation as we have opportunity. 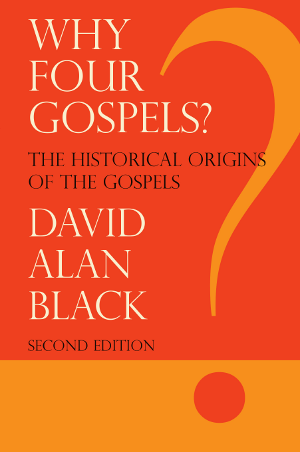 Book Note: The Synoptic Problem and David Alan Black's "Why Four Gospels?" 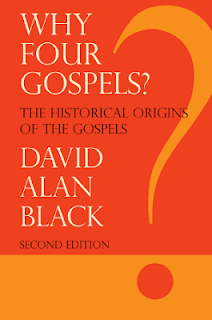 David Alan Black, Why Four Gospels? The Historical Origins of the Gospels, Second Edition (Energion, 2001, 2010): 106 pp. Teaching courses on New Testament Introduction and the Life and Teachings of Jesus has gotten me thinking again about the composition of the four canonical Gospels and especially the perennial question of the literary relationship, if any, among the first three Gospels (the so called “Synoptic Problem”). For about the first 1800 years of the New Testament canon, most believers and scholars held to the priority of Matthew as the first written Gospel. The so-called “Augustinian proposal” (so titled since this was the view of Augustine of Hippo) held that the Gospels were composed in the order in which they appear canonically (Matthew-Mark-Luke-John). In the nineteenth century, the German scholar J. J. Greisbach (1745-1812) proposed that Matthew and Luke were written first and that Mark provided an abbreviated synthesis of both Gospels. This came to be known as the “Two Gospel” Hypothesis. Later in the nineteenth century, the “Two Source” Hypothesis was suggested by C. H. Weisse (1838) and crystallized by H. J. Holtzmann (1863). This theory argued that Mark was the first Gospel and that Matthew and Luke drew upon Mark and a hypothetical sayings document which German critics dubbed “Q.” The theory was expanded in 1924 by British scholar B. H. Streeter who suggested the so-called “Four Source” Hypothesis: namely that Matthew and Luke were dependent on Mark, Q, and two other hypothetical sources called M (for special Matthew material) and L (for special Luke material). The view of Markan priority has come to be the reigning opinion down to the present day in the academy and has even been embraced by most mainstream evangelical scholars (e.g., Craig Blomberg, Robert Stein, Darrell Bock, D. A. Carson, etc.). There are occasional dissenters to the scholarly orthodoxy. William R. Farmer, for example, tirelessly attempted to revive the Griesbach (or “Two Gospel”) Hypothesis in the modern era but ultimately failed to overturn Markan priority as the majority opinion. At the least, however, Farmer reminded scholars that Markan priority was only a theory and not an assured fact. I just finished reading another effort to challenge Markan Priority, as proposed by David Allan Black who teaches at Southeastern Baptist Theological Seminary. Black presents his views in Why Four Gospels: The Historical Origins of the Gospels, Second Ed. (Energion, 2001, 2010). In the preface to his work he notes that he is nearly entirely indebted in his theory of Gospel origins to the work of RC scholar Bernard Orchard (1910-2006) who advocated a variation of the Griebach Hypothesis. Black dubs this view the “Fourfold Gospel” Hypothesis (based on a reference to the “Fourfold Gospel” in the church father Irenaeus). Black contends that modern scholars have wrongly jettisoned the external evidence concerning Gospel origins from the early church fathers which strongly support Matthean priority. He observes, “Today the academic guild, both in Europe and North America, assumes that the patristic evidence is basically legendary and unreliable” (p. 32). Rather than give credence to external evidence, modern scholars have devoted nearly all their attention to internal evidence (comparing and contrasting the texts of the Synoptic Gospels and attempting to theorize a literary explanation for their origin, sources, and dependence). The end result, however, has been a decided lack of consensus and clarity. Black observes: “But far from achieving their objective in this way, the result of over two hundred years of endeavor has been frustration and stalemate, and not a few critics have come to the conclusion that the problem is insoluble—and so it is [without external evidence]” (pp. 36-37). He adds, “All that internal literary criticism can do is show how an existing text could have originated in more than one way. But the decision as to which is the correct way requires the help of history, if it is to be reached at all” (p. 37). In the end, Black posits a rather detailed theory of Gospel origins which he pieces together from various patristic sources and his own fertile speculations. He holds that Matthew was written first by the apostle Matthew sometime before 44 A. D., making it among the earliest canonical writings and “the prototype of the gospel genre” (p. 53). It reflects the views of Jesus held in primitive Jewish Christianity. The Gospel of Luke was then commissioned by the apostle Paul and the writing entrusted to his associate Luke sometime around 60 A. D. when Paul was imprisoned at Caesarea. “Under the guidance of Paul and in light of his experience among the Greeks, Luke was able to restate the main teaching of Matthew in a form and style that appealed to the Greek mind and heart” (p. 59). This theory next holds that Mark was produced in order to synthesize Matthew and Luke and, most importantly, to “provide accreditation for the Gospel of Luke” as a legitimate presentation of the life of Jesus (p. 60). Black holds that the Gospel of Mark came from a series of lectures given by the apostle Peter in Rome in which he alternated between the texts of Matthew and Luke to synthesize the life of Jesus, with John Mark at his side recording what Peter said. Black even proposes a historical context for textual confusion regarding the ending of Mark’s Gospel, suggesting that Peter ended his remarks at Mark 16:8, with Mark later adding vv. 9-20 (the traditional ending) to round out the Gospel “as an act of pietas to his old master” (see pp. 66-68). Black even concludes that this theory explains the traditional canonical location of Mark: “No wonder that church tradition inserted the Gospel of Mark between the Gospels of Matthew and Luke as a reminder that it was the work of Mark recording the oral recommendation of Peter that had made possible the acceptance of Luke’s Gospel on equal terms with Matthew’s in the Christian world without danger of further controversy (cf. 2 Peter 1:1)” (p. 67). Finally, the fourfold canonical Gospels were completed with the writing of the Gospel of John by the aged apostle and son of Zebedee around the year 96 A. D. in Ephesus. Black’s theory is highly unlikely to unseat the communis opinio in the mainstream scholarly guild. Even for those who are willing to give historical credence and weight to the patristic witness on Gospel origins, Black’s speculations go beyond the existing evidence (e.g., his detailed suggestions about the precise number and content of the five hypothetical “lectures” given by Peter in Rome, the role of Mark as Peter’s recorder, his suggestion about how the traditional ending of Mark came to be composed, etc., see pp. 59-69). Still, Black’s efforts are to be appreciated in several areas. These include: First, he rightly challenges the bias of modern mainstream scholarship against traditional, pre-critical views of the canonical Gospels, from issues of traditional authorship to the suggestion of Matthean priority. Second, he rightly points out the lack of consensus and assured results that have been yielded by modern scholarly efforts since the nineteenth century to solve the relationship among the synoptic Gospels based on their proposed literary dependence. Third, he reminds us that Markan priority remains a theory that has not (and perhaps cannot) be proved based merely on internal evidence. Markan Priority is not true merely because it is the reigning hypothesis of modern scholarship and the majority view of the academy. Sermon of the Week: Andy Rice on "Every man perfect in Christ"
Last Sunday Andy Rice preached a powerful message at CRBC from Colossians 1:24-29. Andy and his wife Beth are raising support to go to serve in Africa with Action Zambia. The sermon presents a solid exposition of the text as Andy outlines the goal of a Scriptural ministry whether in America of Zambia or wherever we are: to present every man perfect in Christ. To read more about Andy's ministry in Zambia, visit his website. The Vision (3/7/13): A. W. Tozer on "The Menace of the Religious Movie"
This past week I’ve had a couple of people ask me what I think about the new History Channel mini-series “The Bible,” which opened earlier this week to huge ratings. Though I had not heard of the series till this week there has apparently been an active marketing campaign for the series, especially aimed at evangelical Christians. Rick Warren’s Saddleback Church in California, for example, hosted a 90 minute preview of the series the day before it opened. This raises the whole issue of whether “Christian” film is an appropriate method for either evangelism or edification. The temptation to introduce "new" things into the work of God has always been too strong for some people to resist. The Church has suffered untold injury at the hands of well intentioned but misguided persons who have felt that they know more about running God's work than Christ and His apostles did. A solid train of box cars would not suffice to haul away the religious rubbish which has been brought into the service of the Church with the hope of improving on the original pattern. These things have been, one and all, positive hindrances to the progress of the Truth, and have so altered the divinely-planned structure that the apostles, were they to return to earth today, would scarcely recognize the misshapen thing which has resulted. 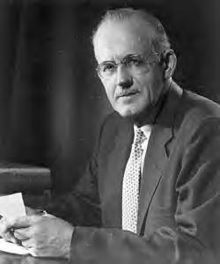 If you want to read or listen to Tozer’s entire article, you can find it in several places online (here is one place where you can read it and one place where you can hear it read). May we not deviate from the revealed means that God has given for converting sinners and edifying saints: the preaching of his Word (1 Corinthians 1:21). A friend recently pointed me to this website hosted by E S. Williams (and friends) offering a critique of "New Calvinism." Dr. Williams pulls no punches in offering a critique of leading neo-evangelical Calvinist lights including John Piper, Mark Driscoll, Tim Keller, and Al Mohler.